Steven Michael Rivera was traveling northbound near Hood-Franklin Road about 9:30 p.m. when he suddenly veered off the freeway, lost control and was thrown from his 2009 Harley-Davidson motorcycle, according to the California Highway Patrol. An off-duty California Highway Patrol officer was killed in southern Santa Clara County early Tuesday in a collision with a truck while on his way to work. Authorities said the officer was on a motorcycle on the way to work when was involved in a crash with a truck at 5:51 a.m. on the Monterey Highway just south of Chester Street near San Martin. The initially unidentified 44-year-old officer assigned out of the Gilroy CHP office was declared dead at the scene and his body was covered with an American flag. CHP officials did not immediately release the name of the officer while his family was being told. According to witnesses, Davis was unable to get over into the proper lane as the pickup passed and was forced to lay his motorcycle down and then collided with a stopped minivan waiting to travel south on Polk City Drive. The fatal motorcycle crash happened at about 5:25 p.m. on the Northern Blvd. exit ramp of the Grand Central Parkway in Flushing, and not far from Citi Field. Authorities have released the name of the man killed in a motorcycle crash on State Highway 75 in Sullivan County. The crash happened on U.S. 30 between County Roads 500 E and 600 E around 10 p.m., Indiana State Police said. Medical examiners have identified a motorcyclist killed in a crash in the northeast portion of the Valley on Sunday. According to the Clark County Coroner’s Office, 28-year-old Nicholas Turnball died as the result of the crash. 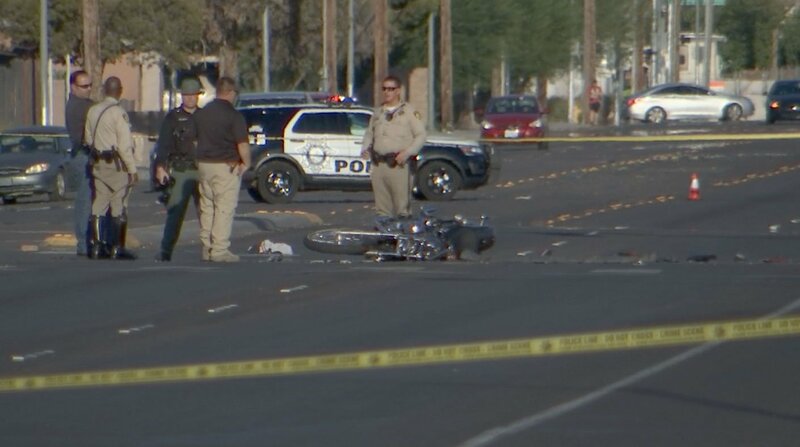 Officers responded to the collision at the intersection of East Lake Mead Boulevard and Christy Lane at 3:31 p.m.
State troopers say a collision between two motorcycles killed one person and injured two others Saturday. The crash happened at approximately 12:20 p.m., according to South Carolina Highway Patrol Lance Cpl. Jedd Jones. The male rider of the motorcycle died at the scene. A woman, who was also on the motorcycle, suffered major injuries and was taken to a nearby hospital for treatment. The motorcycle went to pass on the right around the truck, but made contact with the right side of the truck. The motorcycle lost control and continued north, striking the curb of the median island at the intersection. Authorities have released the name of the man killed in a motorcycle crash on Interstate 81 in Kingsport which occurred around 11 p.m. Tuesday. Kenneth Carson Roller, II, was killed in the crash. A former Eagle Point High School wrestling champion was killed Tuesday morning in a motorcycle crash near the Jackson County Sports Park. This waste-of-space seriously needs to be charged with first degree murder, get thrown in prison and stay locked up for the rest of her miserable life! She killed a guy while driving drunk AGAIN, with a revoked license AGAIN, and with no insurance AGAIN. And the kicker? She has 3 previous DUI arrests and more than 20 citations for driving on a suspended or revoked license! And they just keep letting her out to do it again! Lock her up, sentence her to life in prison with hard labor and throw away the key! Daugaard recognizes the “faces of tourism” to kick off National Travel and Tourism Week. A Black Hawk man has been identified as the victim of a fatal motorcycle accident. The motorcycle-pickup crash happened Saturday on Nemo Road. Each year the number of fatal and near-fatal motorcycle crashes increases after May, according to PennDOT statistics. Between October 2013 and March 2014, there were three serious motorcycle crashes in Northampton County and one in Lehigh County. A Navy Seabee stationed in Gulfport has been identified as the man who crashed his motorcycle on a state highway and died. A fatal motorcycle crash on Cottage Grove Rd. is proving to be a wake-up call for some local bikers. The accident happened at an intersection on Sunday afternoon where a 20-year-old Stoughton man collided with a car. Jonesboro Police are investigating a fatal crash involving a suspect who was running from Arkansas State Police. Authorities in New Hampshire are investigating a motorcycle crash that resulted in the death of a Maine man over the weekend, state police said. Michigan State Police troopers from the Marshall post were dispatched to the area of M-86 and M-66, near Colon, on a report of a motorcycle crash. Since 2012, the number of fatal motorcycle crashes has resulted in 475 deaths — 122 of those deaths occurred last year alone. Motorcyclists have already begun hitting the road this spring, and more will be out soon with beautiful May weather here. The 2002 Harley Davidson collided with a 2002 Ford pick up truck heading westbound. The motorcycle driver was pronounced dead on scene. The accident happened around 5:42 p.m. on Annapolis Road near Oakton Road on Thursday. Darlene Russell had a feeling something was wrong when her husband, Bret Russell, didn’t return home late Sunday night from a motorcycle ride. Details are scarce as the Phoenix Police Department investigates a deadly crash between an SUV and a motorcycle. It happened late Sunday night on 15th Avenue just south of Bethany Home Road. The Pinellas Park Police investigated a crash that involved a motorcycle and two vehicles around 4:40 p.m. Sunday. The crash happened on the eastbound lanes of Gandy Blvd. at Grand Ave.
For every year in the decade prior to 2015, at least a quarter of fatal motorcycle accidents occurred during bike rallies. The demographics of people killed in all motorcycle crashes skew heavily toward men between the ages of 43 and 65. An Erie woman charged in connection with a deadly motorcycle accident in 2015 waived her charges in court Friday. Minnesota has already recorded its first motorcycle fatality of the year. The Redwood County Sheriff’s Office says 60-year-old Gregory Werner was negotiating a curve in Sanborn on Sunday night when he crashed into the ditch. A Lake Forest teenager sustained fatal injuries Monday after crashing his motorcycle on Jeronimo Road, just north of El Toro Road at approximately 12:15 p.m., according to Orange County Coroner’s Office reports. The Rock Island County Coroner has identified the rider killed in a motorcycle crash in Moline on Monday. According to police, a 16-18 year-old boy was killed in an accident on Monday evening while riding a dirt bike. The accident occurred on East 93rd and Raymond Ave. It forced the closure of both the north and southbound bound lanes of East 93. Regional Transportation Commission of Southern Nevada warned. Officers and medical crews responded about noon to the boulevard and Barbara Lane, Metro Police Lt. Grant Rogers said. Two days after a district judge dismissed the charges, Lehigh County prosecutors re-filed homicide by vehicle charges against a woman who allegedly made an illegal left turn into the path of a motorcyclist, killing him and seriously injuring his passenger. A Palmdale woman has been arrested on suspicion of vehicular manslaughter in connection with last year’s traffic collision that claimed the life of 28-year-old Dale Zack. A motorcyclist was killed Tuesday in a collision with a pickup truck on a back-country road east of Lake Henshaw. A 20-year-old Watertown woman who drove head-on into a motorcycle’s path last summer was charged Thursday with negligent homicide. Maryland State Police say they responded to a fatal accident involving a motorcycle last Wednesday at U.S. Route 13 and Md. Route 413 in Westover. Police said they are investigating a motorcycle crash that killed a 51-year-old man in Ventura Sunday evening. Authorities were contacted at 5:30 p.m. about the accident on the Victoria Avenue bridge north of Olivas Park Drive. A motorcycle and school bus collided Wednesday near Harpersville Road and Woods Road, killing the motorcylist, Newport News Police spokesman Lou Thurston said. Motorcycle Accidents: What Is Up With All The Insanity? Pleas of not guilty were entered Monday morning on behalf of a 24-year-old Westville woman accused of driving drunk Nov. 5 and causing an accident that resulted in the death of a passenger on a motorcycle. A motorcycle accident on SPID at the Airline exit claimed the life of 57-year-old Macario Sandoval Sunday night. Detectives are still investigating what caused the wreck in the first place. All lanes are back open after a fatal motorcycle accident shut down the Southwest Freeway near West loop on Thursday afternoon. Driver convicted of murder in fatal DUI crash into Mission Viejo home. A fatal motorcycle accident occurred last night near campus. According to Department of Public Safety (DPS), the Los Angeles Police Department (LAPD) were the first responders. The resident said while locals were shocked by the fatal accident, the intersection where it happened is a “dodgy corner”. Police are investigating a fatal motor vehicle accident involving a motorcycle that occurred at the intersection of Farmington Avenue and King Street Sunday morning. Buffalo Police are looking into a fatal motorcycle accident that happened on Broadway near Bailey Avenue early Saturday morning. Friday evening, Albuquerque police said eastbound Paseo Del Norte was shut down at Eagle Ranch Road due to a crash with injuries. According to authorities, the motorcycle was traveling on the northbound side of the highway when the motorcyclist ran off the side of the road, lost control on the dirt and flipped. The driver was a male and he died on the scene. A woman passenger was taken to the hospital in critical condition. SANFORD, Fla. – A 63-year-old motorcyclist was killed Friday early morning in a crash with a Seminole County Public Schools bus, according to the Florida Highway Patrol. Troopers stated Dewey Nelson, of Sanford, struck the school bus at 7:25 a.m. when the bus pulled into his direct course while crossing Ronald Reagan Boulevard near Carriage Cove Way in Sanford. According to the FHP, as many as 25 students were on the bus, which was going to Midway Grade school in Sanford. None of the students or the bus driver were injured. DANVILLE– A 49-year-old Danville guy was eliminated in a bike accident early Tuesday morning. Champaign County Coroner Duane Northrup said Brian R. Shelley, of Danville, died in a motorcycle accident with an automobile at 7 a.m. Tuesday at the crossway of 900 N County Roadway and 300 E, near Sadorus. Mr. Shelley was pronounced dead at the scene at 8:05 a.m., according to Northrup. An autopsy is arranged for Wednesday, and an inquest might be held at a later date. A Hialeah motorcycle officer was airlifted to the medical facility after an accident on Interstate 95 in Miami-Dade Tuesday. Footage revealed the officer laying on the highway near the motorbike. He was placed on a stretcher and airlifted from the scene to a close-by health center with non-life threatening injuries. The incident had all northbound and southbound lanes of I-95 closed down. The majority of the lanes opened back up a brief time later on.